I have just added three new galleries (within the Motor Boats section of the Galleries menu) devoted to one of the most beautiful wooden motor cruisers to be built on the Broads. 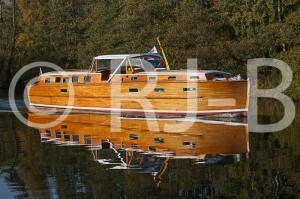 The bespoke 43ft Broom Admiral class motor cruiser Katinka was built for Professor Jack Mayne of Cambridge in 1961. She still remains on her native waters where her current owner continues to lavish the same level of TLC she has received since the day of her launch.